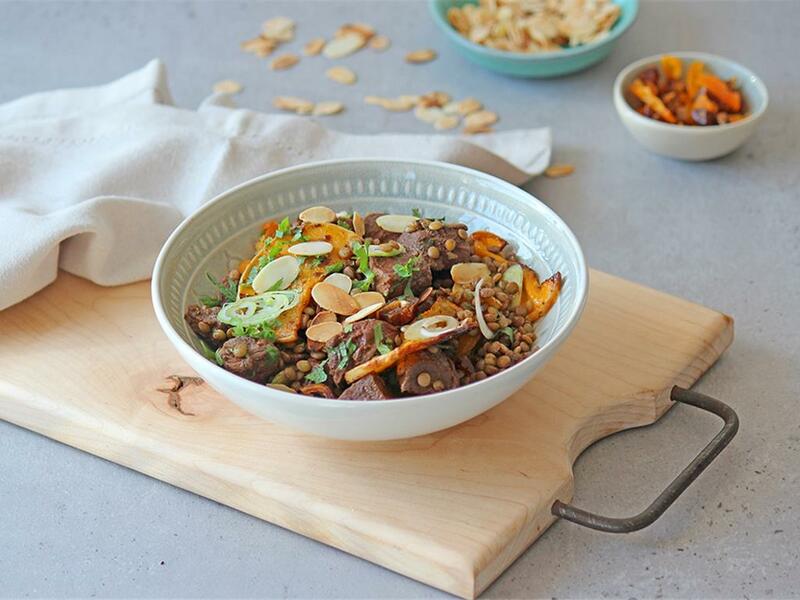 Classic Moroccan style dish with cinnamon & masala spiced lentils & beef, served with dried dates & apricots. Masala Spice Mix: Mix together the cinnamon and garam masala and divide it into three little bowls. Roast butternut: Scrape the seeds out with a spoon and discard. Then slice the butternut crossways into very thin crisps, about 5mm thick. Place on a tin foil lined baking tray with a drizzle of olive oil and season with salt and pepper. Sprinkle 1 bowl of the Masala Spice Mix, then mix and arrange in a single layer. Roast for 25 minutes, until golden and cooked. Brown lentils: Place a pot on medium-high heat and add boiling water (¾ cup). Add the lentils and boil gently for 15-20 minutes until tender. Drain and season with salt. Beef cubes: Place a pan on high heat. Toss the beef cubes in a little olive oil, season with salt and pepper and sprinkle with another bowl of the Masala Spice Mix. When the pan is hot, add the beef cubes and fry for 3-4 minutes until golden brown and cooked on the outside, but still slightly pink inside. Add the beef cubes to the lentils, with the pan juices and the REST of the Masala Spice Mix and mix through. Serve by chopping the mint leaves roughly and mixing it through the lentils and beef cubes, with the coriander, spring onions, roast butternut, apricots and dates. Drizzle with olive oil and top with the toasted flaked almonds.